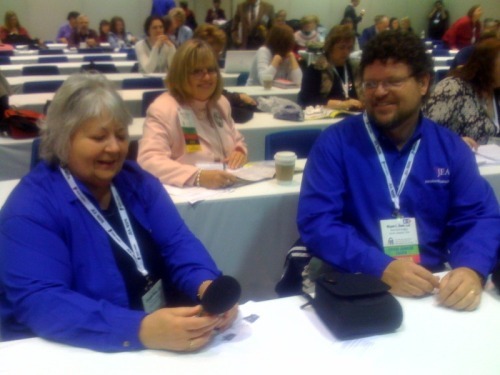 Georgia and Wayne Dunn recorded sections of the JEA membership meeting. Georgia was trying out the H2 Zoom that the mentors received as part of their audio training. Georgia and Wayne are mentoring in Ohio and were selected to be part of the first mentoring group. Their work is funded by the Ohio Newspaper Association. ← Peggy Gregory, Linda Barrington, myself and Bill Flechtner at the close of the Mentor Forum. The day-long session included hands-on audio training with Judy Robinson. We’re looking forward to mentor podcasts.